Last year, as part of the Navratri special recipes, I blogged crispy Vada recipe (Garelu) that are light and fluffy on the inside with a crisp exterior. 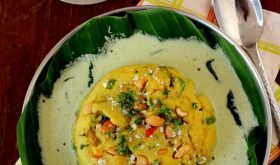 This Diwali, I have for you, dear readers, Andhra style Dahi Vada aka Perugu Garelu (Aavadalu). 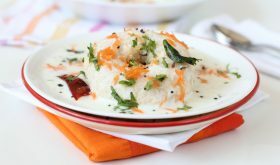 They differ from North Indian style Dahi Vada in terms of the tempering and the use of green chilies and ginger. 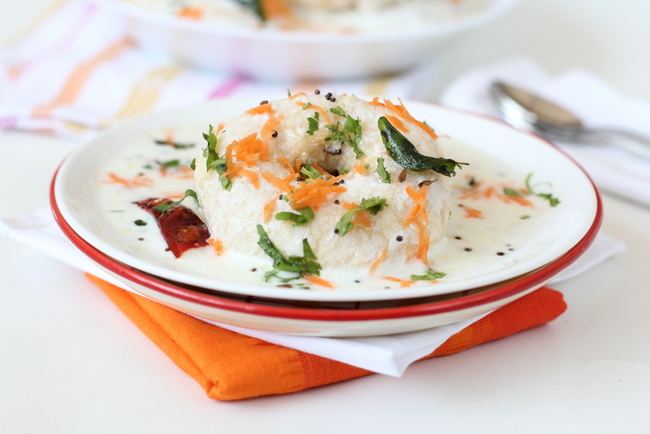 Its the same process as one would prepare Dahi Vada or Tamil style Thayir Vada. Prepare the vadas, soak in water/buttermilk for a few minutes and pour a savory yogurt sauce (seasoned with spices), over the vadas. You can serve them at room temperature or chilled. Perugu Garelu recipe is a must make snack during festivals like Deepavali, at our home. You can serve it for breakfast or as a cold starter/appetizer. Absolute melt in the mouth festive fare! Strain the water and grind the dal to a paste sprinkling very little water. Use small portions of dal to grind batch wise as its easier to grind into a soft paste. Add salt and beat till fluffy. Heat oil for deep frying in a heavy bottomed vessel and heat till piping hot. Reduce flame to medium. Wet your hands with water, take a lemon-sized ball of batter and flatten it into a vada on a greased sheet or banana leaf. Make a hole in the center of the vada so that it cooks evenly all over. Slowly drop the vada into the hot oil and fry it on both sides on medium flame to a golden brown color. Deep fry 3-4 vadas per batch depending on the size of the vessel. Remove the vadas onto a bowl of water or thin buttermilk. Allow them to soak for 3 minutes. While the vadas are soaking, prepare the yogurt/curd mixture. Heat 2 tsps oil in a vessel, add mustard seeds and allow to splutter. Add cumin seeds and split gram dal and allow them to turn lightly brown. Add red chilies, green chilies, ginger, asafoetida and curry leaves and mix for a few seconds. Turn off heat. Beat the thickened curd/yogurt by adding about three fourth cup of water. Add salt to taste and pour the tempering of spices over the beaten yogurt and mix. Keep aside. 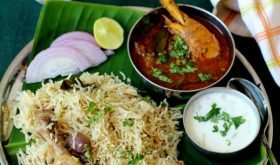 Remove the vadas from the water and place on a serving plate. 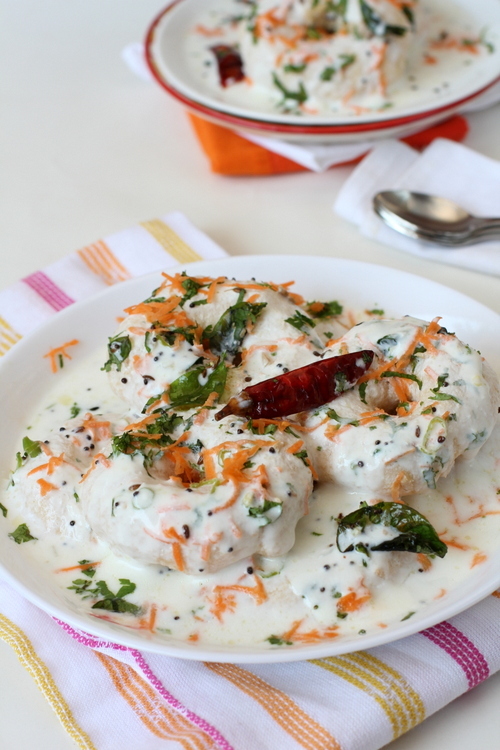 Pour the tempering yogurt sauce over the vadas. Garnish with coriander leaves and grated carrot. If urad dal or whole skinned black gram dal is soaked for over 8 hours, the vadas absorb less oil and are tastier than the vadas prepared from dal which is soaked for only 2 hours. You can soak the deep fried vadas in buttermilk or water. You can make a paste of green chilies and ginger and mix with the beaten curd. By Sailu Published: November 12, 2012 Perugu Garelu, an Andhra style recipe, is prepared during festival times in our home. 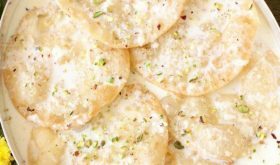 Learn how to make Perugu Garelu as part of your Diwali festival meal. 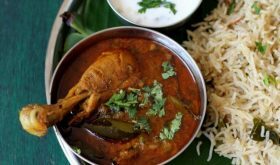 Wishing you and your family a very happy Diwali…..my husband’s stomach seriously thanks you for the delicious dishes i’ve created by your recipes. Keep it up and wish you a great year ahead ! Hi Sailu, Wish you and your family a very Happy Diwali. Hi, I am a regular visitor to your website and have used several recipes of yours with reasonable success. I want to thank you for the same. 🙂 I have also decided to contribute my two pennies worth to this wonderful blog. This is a tip I got from my aunt nd she makes excellent avadalu. 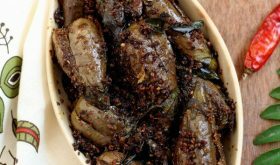 Soak a teaspoon of mustard seeds for an hour or so, grind them to a paste and add it to the beaten curd for a wonderful flavor. This gives such a distinct flavor to the curd and hence the vadas that my north Indian friends love these over their much blander dahi vadas. :). Happy Diwali. Looks delicious and i really wanted to try this recipe, but what would be the best substitute for yogurt?